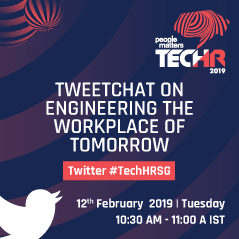 As a precursor to the People Matters TechHR Singapore Conference join this exciting tweet chat where the global leaders, thought leaders, HR Technology partners, and innovators come together to deliberate on key priorities for shaping the workplace of tomorrow amidst a slew of new technologies, changing environments and shifting business models. It is a dynamically changing world whether you are ready for it or not. The incredible pace of technology advancement provides businesses, talent managers and technologists the perfect opportunity to engineer a fascinating workplace of tomorrow. The question is-are organizations ready for the opportunity? Are they ready to harness technologies that could enable disproportionate leaps in work efficiency? What frameworks do they need to put in action to nurture a future-ready digital workforce? How equipped are they to recalibrate their human capital, talent management, employee engagement, and reskilling strategies in order to design their digital future? What are the key challenges that leaders will face while engineering a workplace for tomorrow for a workforce that is becoming more global and diverse? What are the two-three key salient arena's where organizations need to focus in order to design the workplace of tomorrow? The future workplace calls for redefining the employee value proposition for the future workforce. What do organizations need to keep in mind while redesigning their EVPs? The future is digital-what is one most important thing organizations need to keep in mind to further the digital transformation agenda at the workplace for a successful transformation? The future workplace calls for a workforce which is future proof in terms of mindset, skillset, and toolset. What kinds of unconventional strategies do organizations need to adopt in order to improve employee's skills beyond conventional training and education?